It’s that time of year where you might be thinking about packing up your winter things, or at least pushing them to the back of your closet. Before you do that, it would be wise to give everything a good cleaning so that dirt and oils don’t set into fabrics, making them impossible to remove come fall. Basic sweaters and light coats are generally easy to clean, but what about more complicated or expensive items, such as down? Cleaning down can be intimidating. However, you paid good money when you bought your down jacket, vest, or even sleeping bag, and cleaning and maintaining these items will extend the life and keep it more “like-new.” Sounds simple, right? Well, unfortunately, you can’t just throw these items in the washing machine and drier and hope for the best. It is crucial to note that while you must clean these down items, you probably should not do so more than once a year. Excessive cleaning, no matter how properly it is done, can still damage the shell fabric, baffling, and down feathers. Now that it’s spring, what a perfect time to add down wash to your seasonal cleaning routine! There are two ways to go about cleaning your down item. You can either wash it by hand, or find a front-loading washing machine. Top-loading machines can damage the baffle construction. We recommend using a detergent specifically made for down products, such as Nikwax Down Wash. This product won’t strip the natural oils found in the down feathers and also won’t destroy the integrity of the feathers with harsh chemicals. You can use this product to spot clean any tricky stains before washing. Use the amount specified on the bottle for the quantity of items you will be washing; when in doubt, use less detergent rather than more. Follow the care instructions on the label of your garment for water temperature. If you are washing by hand, it is preferable to use a basin or bucket, so that the item is able to come in contact with the appropriate amount of detergent concentration. Gently wash the item, and rinse thoroughly (it may take a few rinses to fully remove the detergent). Be careful when holding the wet item, as it will be quite heavy and may tug or pull the fabric, causing damage. Follow the care instructions when it comes time to dry your item. You may need to lay it flat, hang dry, or use a drier. If you are using a drier, be sure that there is ample space for the item to tumble (in other words, putting your sleeping bag with 3 down coats in the drier is not recommended). Keep the temperature setting quite low, and check back to make sure the garment is not becoming too hot. Once it has dried, you may need to gently break apart feather clumps with your fingers. If any feathers are starting to work their way through the seams, gently try to push them back into the garment. Do not try to pull them out. Carefully feel the down once it has cooled from the drier to make sure that it is truly dry. The last thing you want is to pack up a damp jacket for a few months. 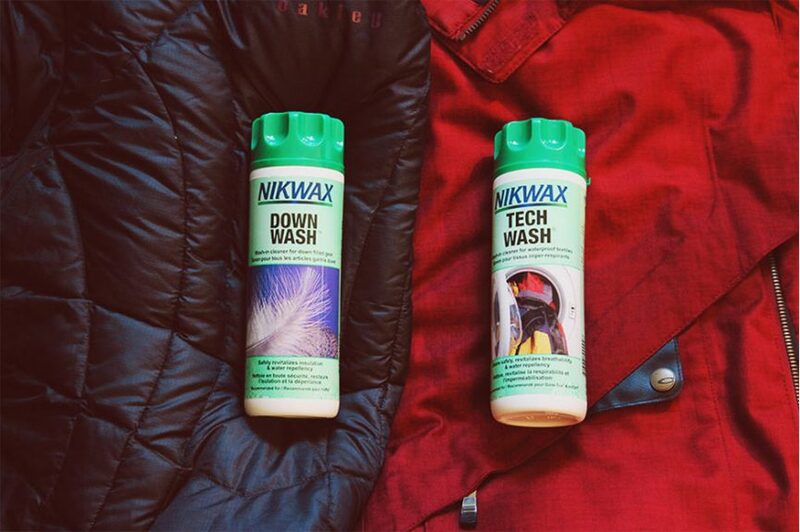 If you have an item that is down while also waterproof, it will eventually become necessary to use a down proof product, such as Nikwax Down Proof. The process is quite similar to washing the garment, and it is especially important to follow the quantity guidelines on the packaging so you don’t have too much or too little product. This waterproofing lasts for about 6-7 washes, so it is quite possible you will only have to treat it every few years.